A few weeks back we went off on a little adventure to kickstart our July holidays. 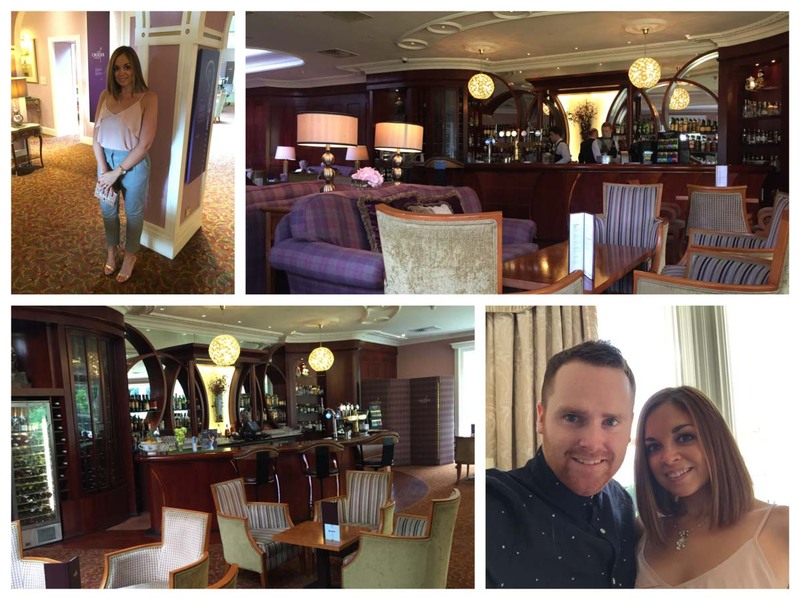 First up was a lovely lunch at the Michelin Starred Deanes EIPIC (which you can read about here), followed the next day by a night of fine dining and relaxation at the luxurious 5 star Culloden Estate and Spa in the village of Cultra just outside Belfast. Located about 15 minutes from Belfast, and conviently placed to explore the popular towns of Holywood and Bangor, along with The Ulster Folk & Transport Museum, The Culloden Estate & Spa is a great spot to escape from it all, while still affording you the option to get out and enjoy the great outdoors or the bright lights of Belfast. 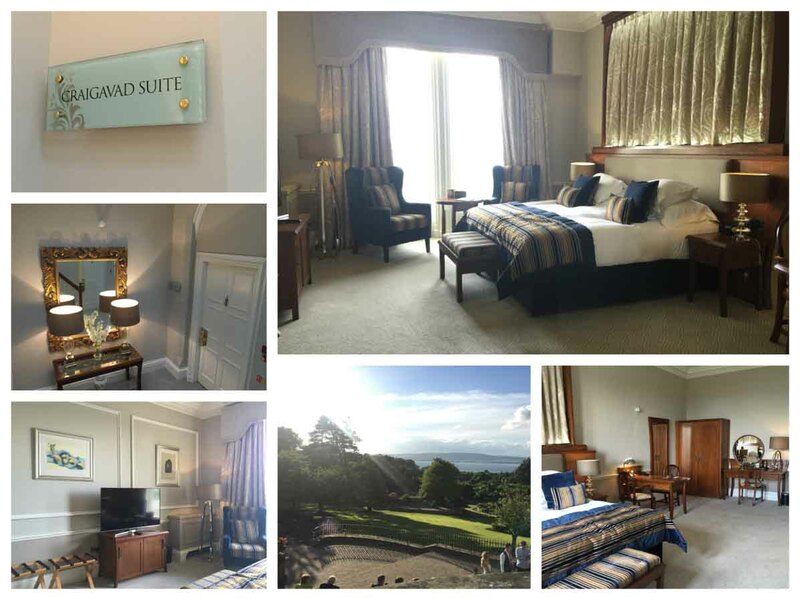 This was our first time at The Culloden Estate & Spa, although we had heard lots of great things about the hotel from friends and family who had been in the past. So what does The Culloden have on offer for its guests? Well, the answer is plenty. Below we share some of the highlights of our stay in the hotel. 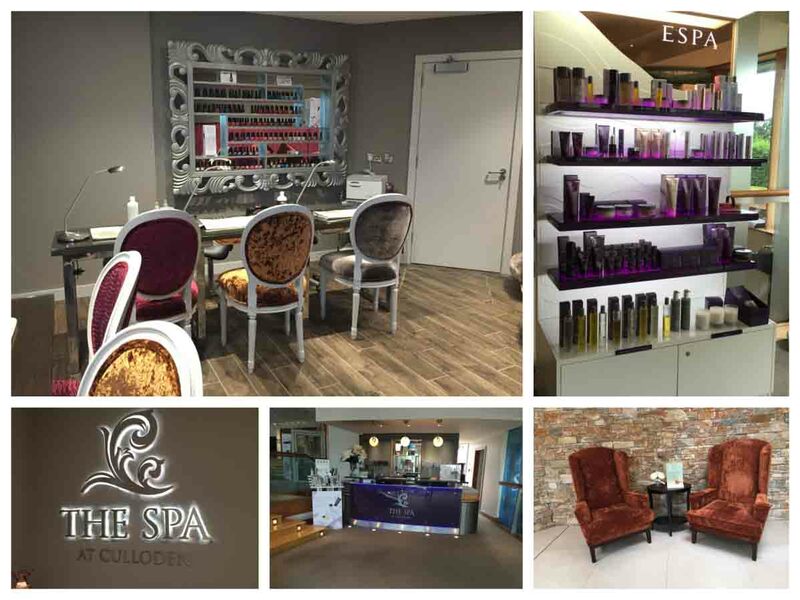 Much like The Slieve Donard Resort & Spa on our doorstep here in Newcastle, one of the big draws of The Culloden Estate & Spa is the hotel’s spa facilities. The neighbouring Cultra Inn is to The Culloden, what The Percy French is to The Slieve Donard. It’s a lovely wee bar with all the charm you would expect from a country pub in Northern Ireland. 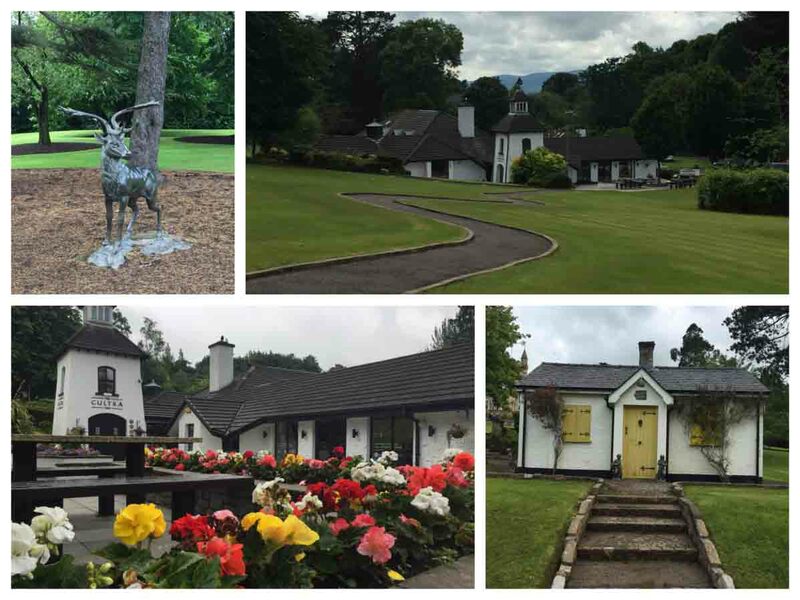 The hotel grounds and the rooms scream luxury, and are just another sign of why The Culloden is one of a small number of 5 star hotels in Northern Ireland. One thing that really impressed us at The Culloden was the food. We enjoyed the 7 course tasting menu (which we’ll discuss more below), and the food really is of such an impeccably high standard. It was the best hotel dining experience we have probably ever enjoyed. 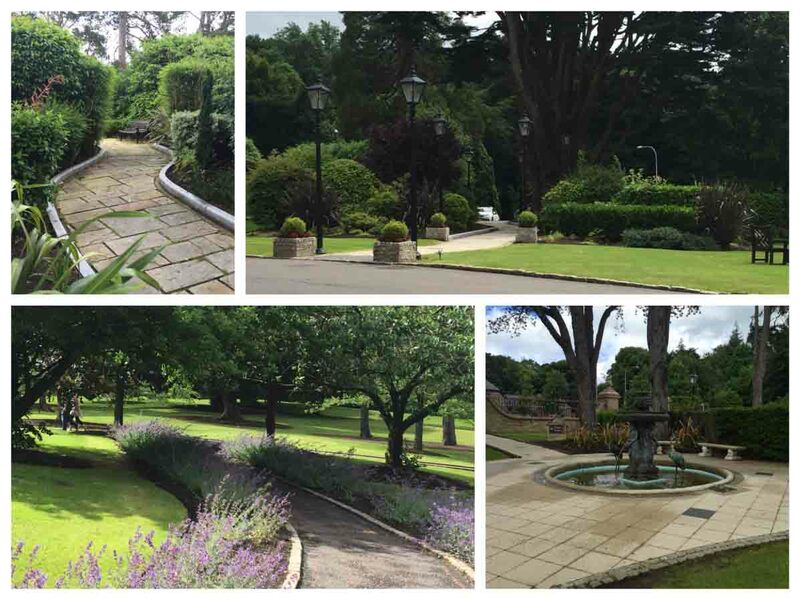 There’s also plenty to see and do in the area surrounding The Culloden, with Holywood Golf Course and Ulster Folk & Transport Museum nearby, while Holywood has a number of nice cafes and shops which are well worth spending a bit of time exploring. So now that we’ve highlighted some of the reasons to visit The Culloden, it’s time for us to share our experience in a little more detail. We arrived at the hotel a little early, and while our room was being prepared for us, we made the most of this time by going out and exploring the hotel grounds, the Cultra Inn and the hotel itself. Weddings are a popular event at the hotel, and true enough there was a wedding on as we arrived, and luckily for the happy couple, the overcast sky quickly disappeared and was replaced by sunlight and a bright blue sky (we’ll take the credit for this 🙂 ). The clear sky brought with it amazing views overlooking Belfast Lough, and once we checked into our room, these views were only enhanced. We stayed in one of the State Suites at The Culloden, the Craigavad Suite, and the room was pure luxury and decadence. The spacious suite is just what you would want if you are looking for a few days of R&R away from your normal busy day-to-day life. The Culloden certainly offers this both in it’s rooms, and the hotel facilities. 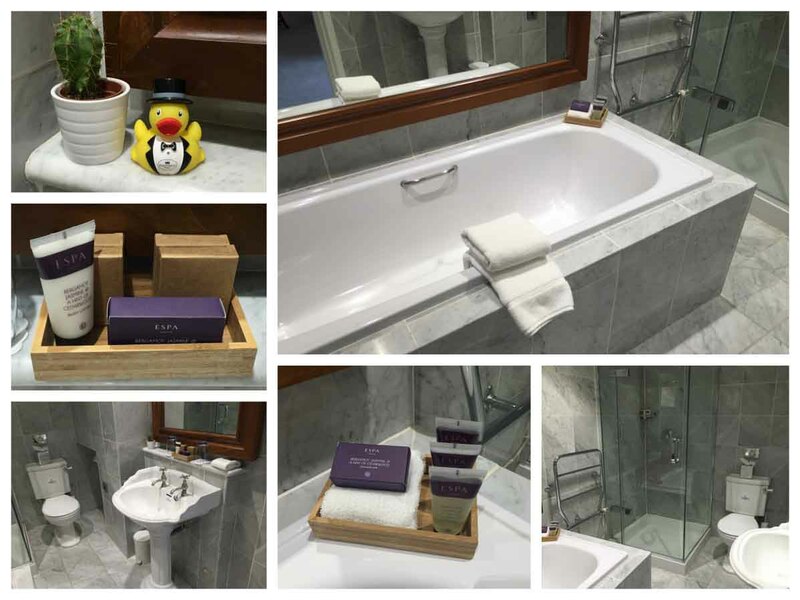 The suite was complete with a large walk in shower and deep soaking bath, and tea and coffee making facilities championing some of NI’s finest producers (Bailies Coffee and Thompson’s Teas). After checking in we decided it was time to go and check out the hotels award winning spa facilities. While the Culloden swimming pool may not enjoy the great views of the likes of the spa at The Slieve Donard Hotel, which looks out at the majestic Mourne Mountains, the facilities are right up there with the very best in Northern Ireland. 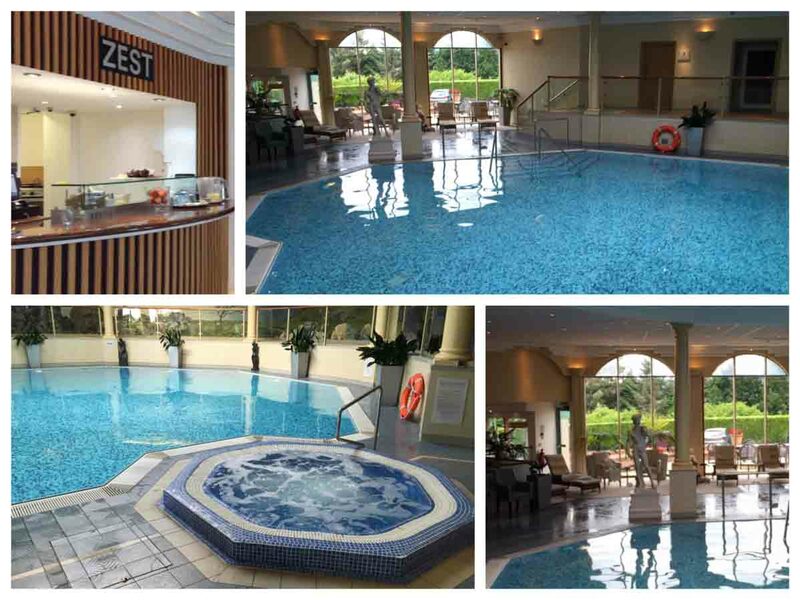 As well as the swimming pool (perfect for visitors of all ages and swimming abilities), the Culloden Spa facilities also include a relaxing Jacuzzi pool, a Zest Juice Bar, a nail bar, a health club and fitness centre with training classes and personal training, and a wide range of spa treatments for guests. While we didn’t avail of any of the treatments, we spent some time relaxing in the pool, sauna and Jacuzzi, as well as enjoying a couple of drinks from the juice bar. A great area to just get away from it all and relax, and this is exactly what we did. With a seven course tasting menu ahead of us, a trip to the spa more than set us up for the day. After our trip to the spa area it was back to the room to get ready for a night of fine dining at The Culloden. We started with a quick drink in The Crozier Bar before making our way to The Mitre restaurant for what turned out to be an amazing evening of food and drink. The Crozier Bar was basking in the evening sun and is just another part of the hotel that allows you to sit back and relax, although this time while enjoying a beer and a cocktail. The ability to relax and unwind was something that was evident throughout our stay. Even while getting ready for our evening meal, this whole break was one of relaxation, and that’s what The Culloden delivers. It gives you an opportunity to just escape, a chance to unwind and forget about everything as you bask in the luxury of the hotel. The Gothic Mitre Restaurant was understandably busy on for a Saturday night and the waiting staff were superbly punctual and attentive throughout our sitting. 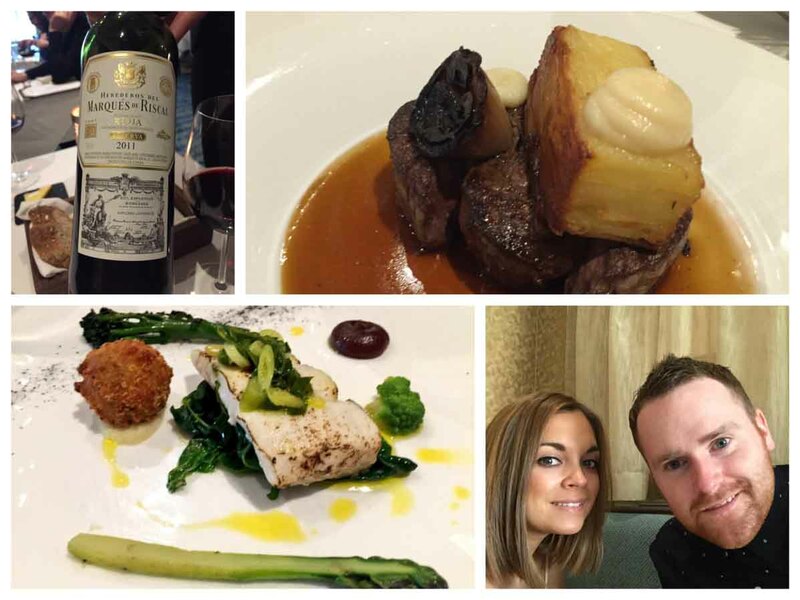 Here’s a quick snapshot of what to expect should you ever decide to dine at The Mitre (and we’d highly recommend that you do). Our tasting menu began with a complimentary amuse bouche of pickled cauliflower, asparagus, roasted celeriac, spring onion and a beetroot emulsion, the perfect way to awaken our tastebuds. Each coure was paired with a glass of wine which really complimented the flavours. The first of our seven courses was a ham hock terrine with peas, apple puree, balsamic and mint undertones. It was served with melba toast and a glass of ‘Alsace Gewurztraminer Hugel’ white wine. We loved the freshness of the mint with the sweetness of the pea and apple and the saltiness of the ham. Next up was seared scallops with a seaweed emulsion, fennel, tomato and spring onion. This was Helen’s favourite course and she loved how delicate and fresh the dish was. The scallops were paired with a beautiful glass of ‘Wakefield Promised Land Chardonnay 2015’ from South Australia. The third course of the night was goats cheese puree, pecans, red grapes, pickled beetroot cubes and a beetroot and balsamic puree. This dish was an explosion of flavours with the sharp balsamic, the sweetness of the pecans and the creamy goats cheese. A glass of 2014 ‘Saint Clair Family Estate Pinot Noir’ was paired with this course and it worked beautifully to intensify the flavours. Following our opening three courses, was the fish dish. The fish course was sous vide halibut, served with a burnt apple puree, cabbage, broccoli, asparagus and a potato and leek fritter. This was Nial’s first time eating halibut and it was his favourite dish of the tasting. The sous vide cooking method certainly enhanced the flavours of the fish and each bite just tasted so fresh, a real clean plate of food. This course was served with a glass of ‘Eric Louis Sancerre’ white wine. The Elderflower notes in this wine complimented the fresh undertones of the dish. Next up after the fish course was the fillet steak main. The meat was from the award winning Carnbrooke Meats in Dromore, and it was a 28 day salt aged fillet. Served with a celeriac puree, a potato terrine and a red wine jus, these simple yet rich flavours allowed the meat to shine through on the plate. The burnt onions added a barbecue like flavour which added to the robust nature of the dish. 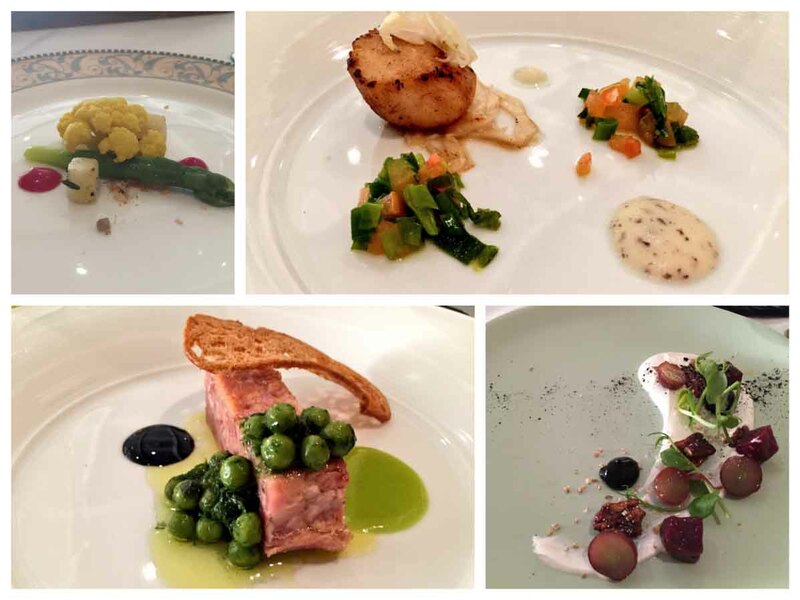 This course was wonderfully paired with a glass of ‘Heredros Del Marques De Riscal Rioja 2011’. Our last courses of the evening were the dessert and cheeseboard, and we had just about both left enough space to enjoy these. First up was the dessert, a smoothly delicate peanut butter parfait with a chilli jelly and raspberries served with a crumb and dessert wine. The chilli jelly certainly packed a punch and if you’re not a fan of chilli dishes, this may be a step too far in your dessert, but when combined with the creamy parfait it was the perfect combination of heat and chill, once more awakening our taste buds. 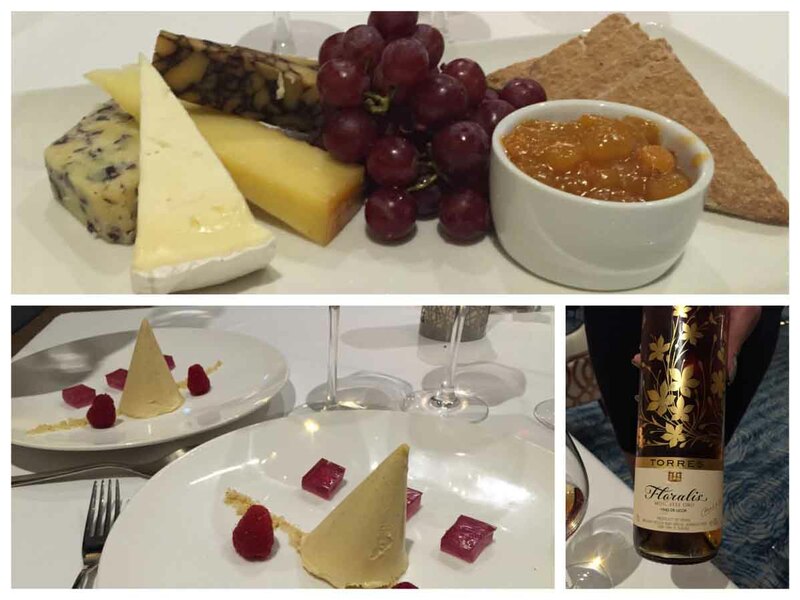 We sipped on a glass of ‘Floralis Moscatel Oro’ dessert wine. We finished the evening with a cheeseboard that included a smoked applewood, a Ballybrie and a Guinness Porter cheese, served with a mango chutney, grapes and Ditty’s oatcakes. We enjoyed a glass of vintage ‘2007 Churchill Reserve Port’, a great way to finish what was a fantastic dining experience. The Culloden website describes dining in The Mitre as a place to ‘dine in ultimate style’, and well, this was certainly an ultimate dining experience. The staff were fantastic, the food was great, and the overall experience was certainly one to remember. Each course felt like it had a real purpose, and delivered so much flavour. Indeed, each course was an experience in itself with the halibut and scallop courses the highlight of the evening for us. After our meal we headed down to the Cultra Inn for a wee nightcap. The bar was pretty quiet which was nice, as this allowed us to relax once more before calling it a night. This was the perfect way to end the day, a day in which relaxation was at the very heart of it. 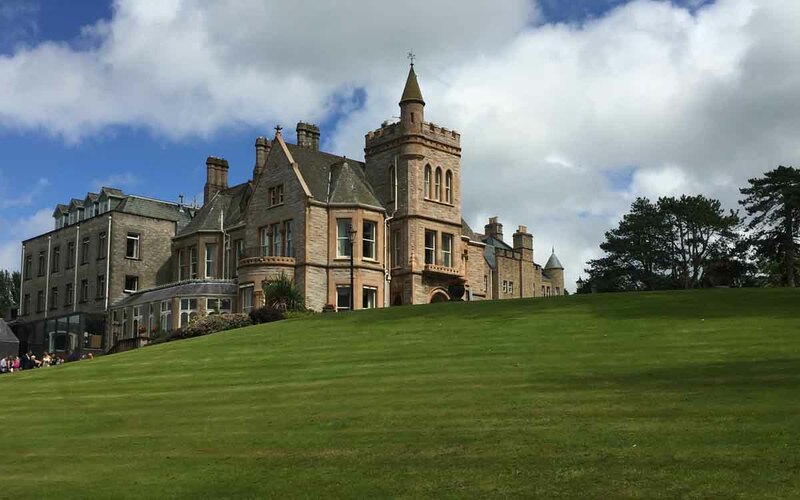 As we’ve said already in this article, if you’re looking for a luxury hotel break that can really help you relax and unwind then The Culloden Hotel is the perfect venue for such a getaway. 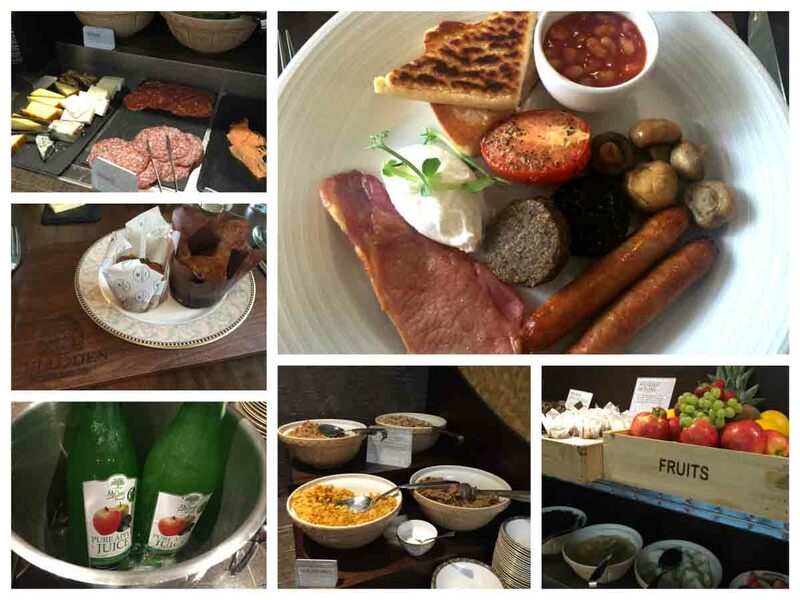 As with all Hastings Hotels, the Culloden prides itself on the local provenance of it’s food, something we spoke about following our trip to the Stormont Hotel. After our perfect day of relaxation and a great nights sleep, we were ready for the day ahead. First up was breakfast, and after the great food on offer the previous night, it’s fair to say we were looking forward to it. We always enjoy getting breakfast at a hotel when we stay the night, and the Culloden certainly didn’t disappoint. The hotel offers a buffet continental option and a made to order selection of cooked breakfast’s. Breakfast was washed down with a Bailies coffee and a refreshing glass of McCanns apple juice. As the sky started to turn grey overhead, we took another walk around the stunning grounds before hitting the road and making our way on to Derry. While the weather was a little too familiar for a Northern Irish summer, and restricted the time we could spend outdoors both in Holywood and Derry, our stay in the Culloden was one that certainly recharged the batteries and we can’t wait to get back to stay again. 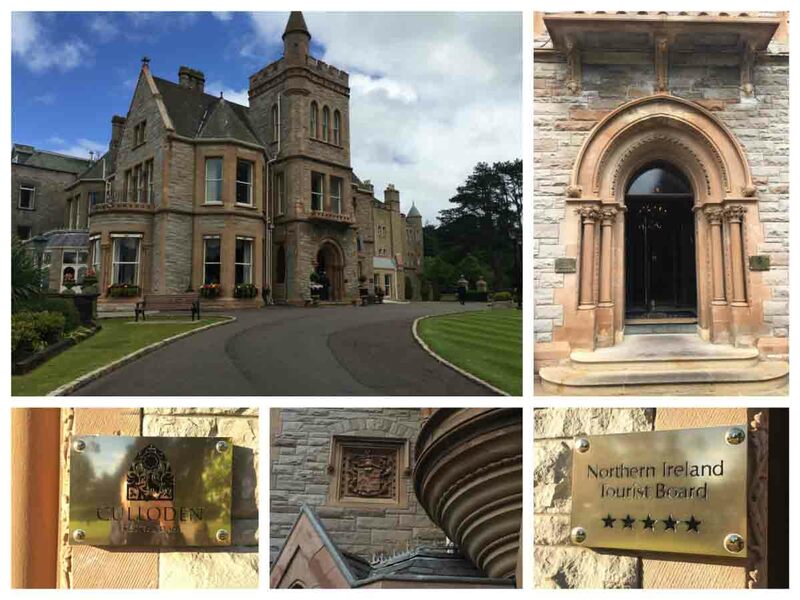 If you are looking for a relaxing hotel break in Northern Ireland, with that added bit of luxury, then look no further than the Culloden Hotel. Here’s a short video highlighting our experience, which should give you another little taster of what the hotel and spa area have to offer guests. Have you stayed at The Culloden? Have you ever stayed at The Culloden Estate and Spa or even just visited it for the day to dine in The Mitre or relax in the spa area? We’d love to know what you thought of it and if you enjoyed your experience as much as we did. Feel free to let us know below in the comments section, or by sharing your experiences with us on Facebook and Twitter. You can also keep up with all of our travel adventures by subscribing to our YouTube channel. 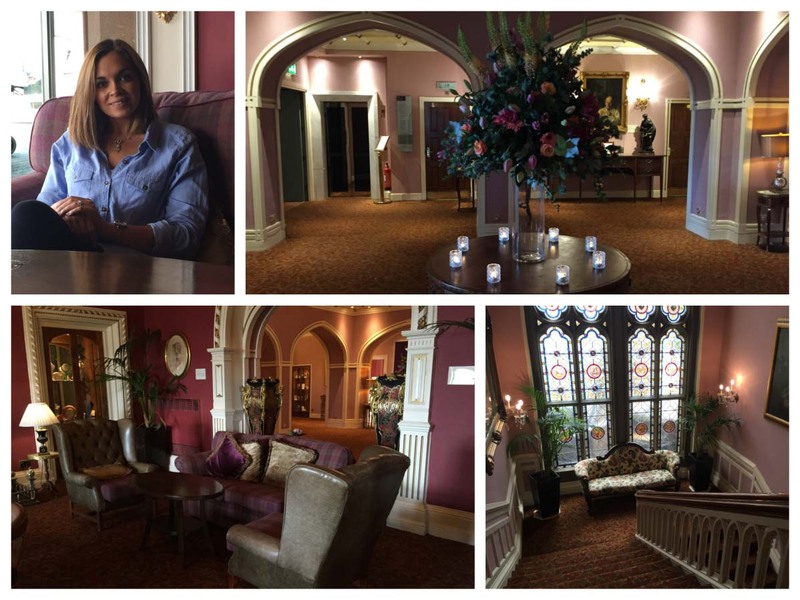 We were invited to stay and dine at The Culloden Hotel by the lovely guys at Hastings Hotels. All views expressed above are entirely our own.